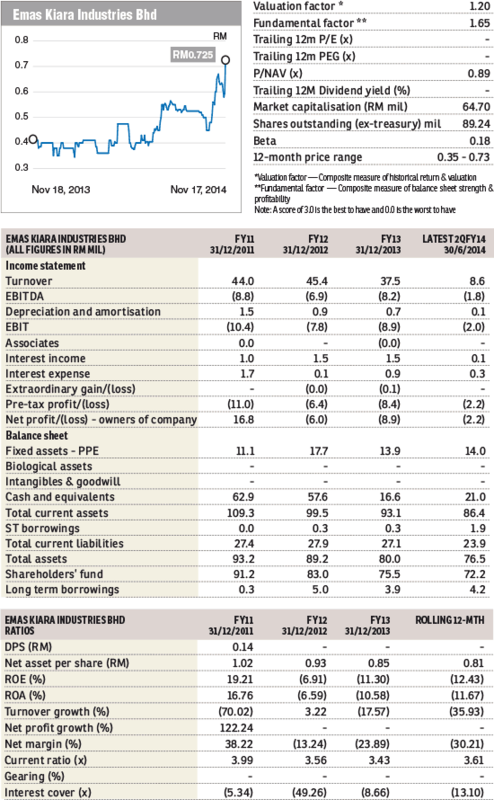 Since mid-Nov 2014, Emas Kiara Industries’ (EKIB) shares have surged 25% to a three-year high of 74 sen. The catalyst was a major restructuring involving the sale of assets and the acquisition of a project in Johor which will shift its entire direction towards property development. 1) Disposal of NobleCorp Lands for RM9.11 million cash and settlement of RM29.55 million in inter-company loans advanced by EKIB. NobleCorp owns several parcels of land in Sabah. 2) Disposal of Emas Kiara for RM2.56 million cash and settlement of RM7.3 million in inter-company loans advanced by EKIB. This subsidiary currently owns a factory and land in Rawang. 3) Proposed acquisition of MB Max for RM45 million cash from MB Land. The sale of assets will raise RM48.52 million, of which RM45 million will be paid to MB Land. MB Max has the development rights over a project in Johor Bahru measuring 35,037 sq ft, called Phase 2, Plaza DNP comprising 273 units of serviced apartments. According to the announcement to Bursa Malaysia, the estimated GDV is RM264.63 million with gross development profit of RM99.99 million. MB Land will provide a minimum net profit guarantee for FY December 2015 and 2016 of RM15 million and RM16 million respectively, with aggregate net profit for FY2015 to 2017 of RM51 million. EKIB has been struggling to find its footing after divesting its manufacturing business in 2011, and has been loss-making in 2012 and 2013. While the venture into property may improve its fortunes, one also has to recognise property cycle risks and enforceability of the profit guarantees. The stock is currently trading under its proforma book value of 82 sen post-restructuring. This article first appeared in The Edge Financial Daily, on November 19, 2014.